At a reunion for staff members of The Temple News this past weekend, alumni from all eras of the paper returned to Temple University’s main campus to reminisce about the pitfalls, the relationships, the drama, the typos and, of course, the news. We talked about presidential elections, about administration failures, about staff conflicts and about romps in the fourth-floor newsroom. 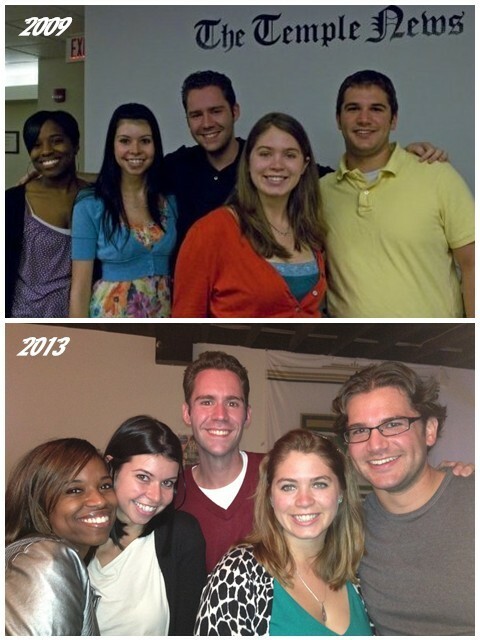 I came to a quick realization when I was thrown back into a setting surrounded by my colleagues from 2008-2009. For each of us individually, many things have changed over the past four years. However, our relationships with each other now, I would argue, are just the same as they were — if not stronger. We didn’t know it at the time, but when we began working at The Temple News, we entered a fraternity. We became engrossed in putting together a weekly product in print and a daily product on the Web. We spent hours crammed together in a cluttered newsroom reading and re-reading copy, cutlines and those tricky decks. And amid the style disagreements and word choice objections, we learned so much about each other and inadvertently formed bonds that are not easy to break. That was reinforced this weekend. Our conversations were effortless. We hugged (a lot), we laughed, we argued and we gossiped just like we did four years ago. These people get me. Just like I get them. Now, I find myself looking forward to four years from now, when I hope we’ll be reuniting once again in the same setting to reminisce and catch up as we did just days ago. I hope that for many of these people, it won’t take four years for me to see them again. But as life takes its course and schedule conflicts come up, I realize waiting so long might be a reality. But I’m not worried. For as much as things have changed, they will also stay they same.